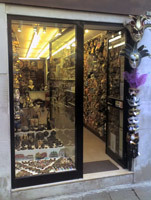 VENETIAN MASKS, MURANO GLASS GIFTS AND MUCH MORE..
To reach '900 Veneziano from the railway station of Piazzale roma, just follow Strada Nuova street until the Venice Casino, or take the boat at "S. Marcuola" stop. You can not miss us! We are located just below the Casino's banner, at the corner between Strada Nuova street and the street of the Casino.